If you want to have a private get together with a couple of friends and would like to enjoy the picturesque outdoor scenery in the process, why not enlist the aid of the Undercover Sport-Packer Super Lightweight Aluminum Canopy Package with White Top? Designed to provide enough cover for as many as four adults, both you and your friends will agree that you not only had a wonderful get together but also that everyone was able to spend their time enjoying the highest level of comfort possible. What is the height/length of the carrying case? With the unit stored in the carrying bag, it is only 54" tall. I'm going to the beach next month and it might get a little windy. Is this lightweight canopy good in the wind? We do have additional weights and stakes but would it be ok if we leave it up for 3 days or so? The ventilated top on this model will aid in windy situations, but I would still recommend using the additional weights and stakes. If you are to leave the canopy up for an extended period of time, I would suggest lowering the frame down as low as possible. What style legs does this canopy have? This is a straight leg style. So easy to set up and take down! So, I got this and thought to my old self, "This will never be as easy as stated in the ad!" Boy, was I every wrong. After the initial putting together at home, my friend and I took it to a tack sale and put it up in no time! I'm a female in my 60's and it's really wonderful. Just wish that it had a side to it. 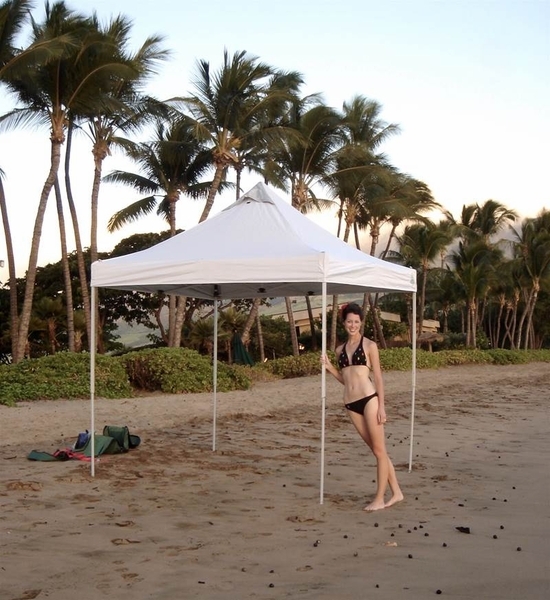 This canopy is lightweight, sturdy, easy to assemble and set-up. We are using it at our seasonal campsite and it also fits on our deck at home. The pole adjustments are easy to use for the not-so-strong like myself. It works well in light to moderate rain so far. It has good foot pads with spikes and canopy tabs to help secure it in windy conditions. The carry case is sturdy and can be lifted by handles or back pack straps, and has 2 zippered storage pockets. The extra blue quarter sun panel could be more useful if it were a half panel, but this is minor. I love the color and quality over all. Prosgood quality denier, solid aluminum frame, great pole adjusters, lightweight, water resistant, looks great. Purchased this for my daughters swim meets and am very pleased. It's light enough for me to take in/out of the car. I am also able to roll it & carry chairs to the swim meet all in the same trip. I fill the gravity bag with water once I get to the meet and then recycle the water on nearby plants. 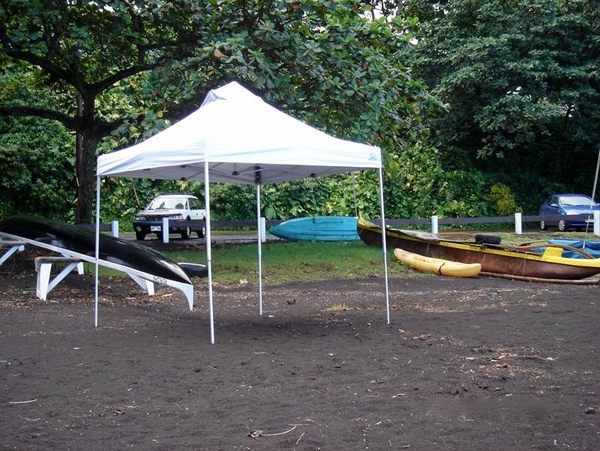 The canopy comes with a small side wall strip and it provides just enough coverage to shade out the few hours of sun that make it underneath the canopy. It took a while to figure out how to lock in the legs (Suggestion: take the canopy off on the corners to snap the legs into place and then slip the canopy cover back on before extending the leg height. 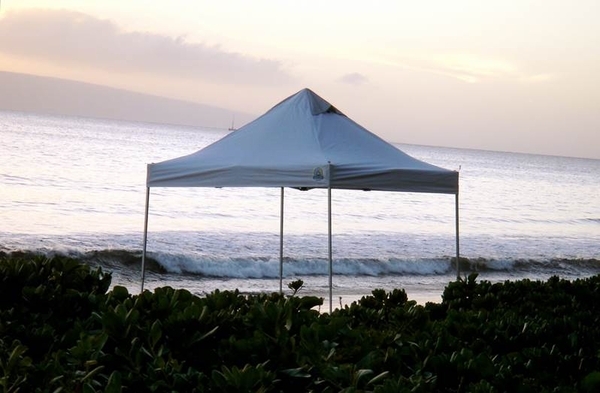 This is a nice light weight canopy that we have been using on the beach. It brings a nice carrying bag for it. It is also sturdy and easy to put away. I have also been asked where I can buy it. Overall it was the best price compared with many other website. ProsLightweight, sturdy, Fast delivery, great shade. Also used for house party. Love the weighted anchor to hold canopy down. Top came with buttons on backwards . Undercover (manufacturer) didn't seem too concerned about fixing problem. Terrible in the wind. ConsNot good in wind. Undercover (manufacturer) customer service not very good. Easy to transport and easy to carry to your favorite spot on the beach or soccer game. Love the backpack feature, my husband will now bring it to the kids games, our old heavy steel one sits in the garage. Sets up quickly and easily anchored. UV protection is evident. Allows hours of family time on the beach in a shady area!. I highly recommend. Conslimited on head clearance only 77"